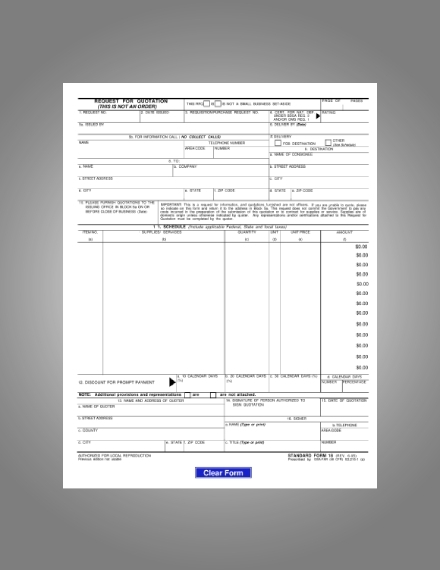 It is common for business entities to have several documents related to their sales transactions. These papers help in documenting the transaction as well as making the transaction smooth and fast. 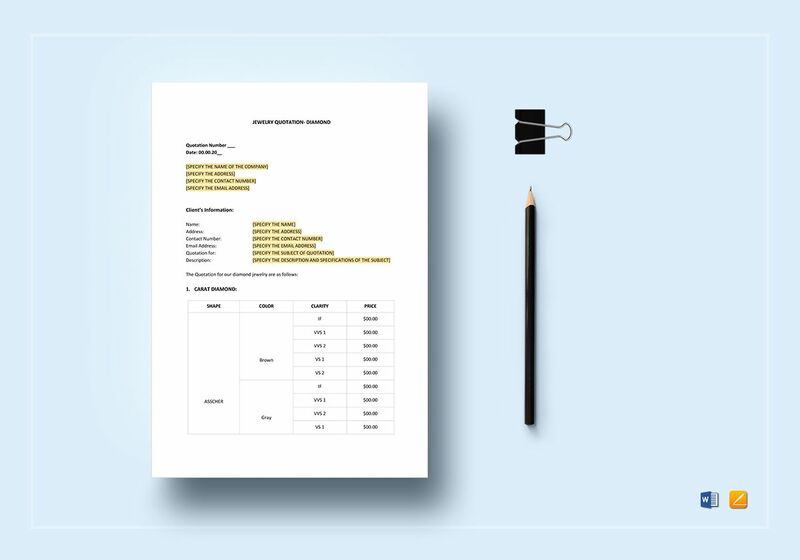 Among the important documents related to a sales transaction is the quotation, which is also known as price quotation or sales quotation. 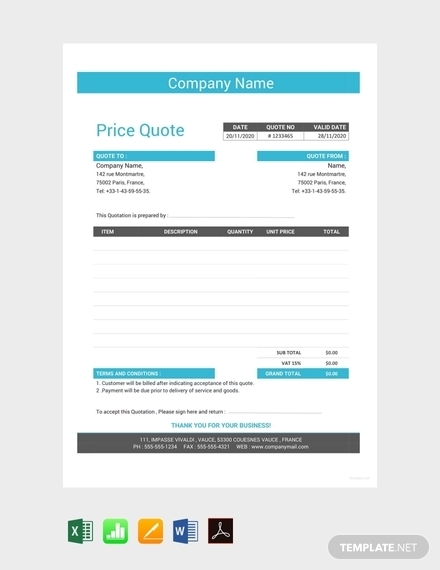 A quotation is made by the seller or service provider that is to be sent to a potential customer providing details of the amount, quantity, and other important information of a product or service as a response to the customer’s order or request for a quotation. 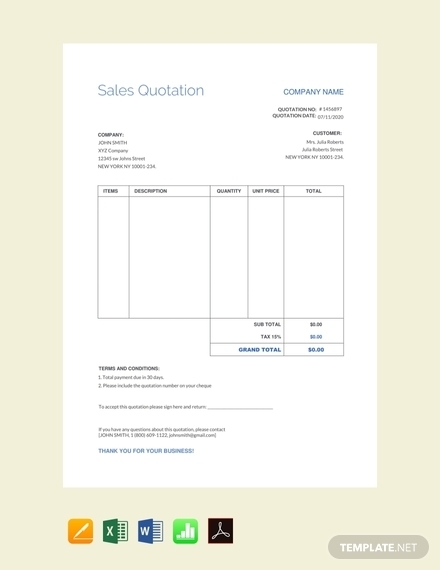 More on examples and templates of quotation are presented in this article. 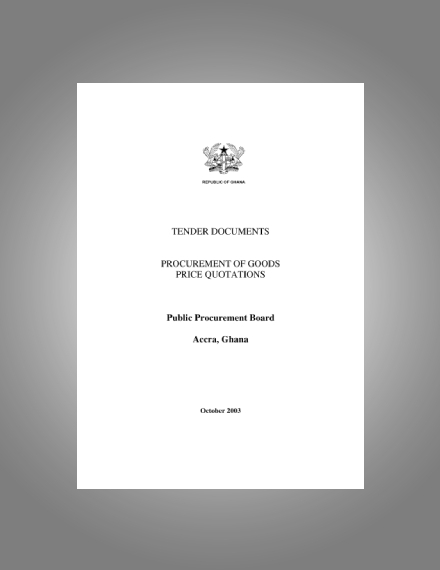 In a sales transaction process, the customer would first send an order or request for a quotation to the seller asking for the details of specific items. As a response, the seller would send a detailed quotation of the items as requested by the seller. The quotation, for it to be complete, must comprise the following important information. 4. Product information: This is the primary concern of a potential customer. They want to know the specifics about the product that they want to order from you including the size, color, quantity, and variations of the product. On the other hand, it is also possible for the customer to specify beforehand the items that he or she is requesting. In this way, the seller would only provide other details that are to be discussed below. 5. Price per quantity: The price of the item is also the main concern of the customer. Thus, the price per quantity of the item must be clearly specified in the quotation. Discounts and promos must also be indicated not just to inform the customer of a possible deduction of the price but to encourage them for an immediate purchase as well. Note that when you offer discounts, it is better that discounts would be applied if the items are purchased in bulk within a specified period. The limitation of the period would prompt them to take an immediate action before the period expires. 6. Taxes, fees, and other charges: Another important information that your potential customer must know are the taxes, fees, and other charges. They must be well aware of the additional charges that they possibly incur when purchasing your products or services. Other charges may include shipping and transaction fees which are to be shouldered by one of the parties of the sales transaction. 7. Warranty: One of the features that a potential client would like to avail is the warranty of your product. Typically, a product contains service warranty or replacement warranty over a specified period of time. Hence, it is important that the warranty period must be clearly specified as well as the scope of the warranty. In determining the period of the warranty, considerations may include the nature of the product or according to the discretion of the manufacturer or seller. 8. Totals: The totals that a customer is concerned of are the subtotal and grand total of the products which are listed on the quotation. Subtotal pertains to the amount of all the goods in the list. On the other hand, grand total represents the overall and final amount to be paid by the customer which is comprised of the subtotal plus taxes, fees, and other charges less discounts. 9. Notes and terms and conditions: A concise statement of the terms and conditions for the sales as well as the notes must also be indicated in the quotation. Included in notes are the supplementary information on the details of the products or services listed in the quotation as well as the agreement and limitations on that specific sales transaction. 10. Signature: The final element that must be present in a quotation is the signature of the person authorized and in charge of the transaction, which is usually the salesperson whose important information such as the name and contact details are specified in the quotation. 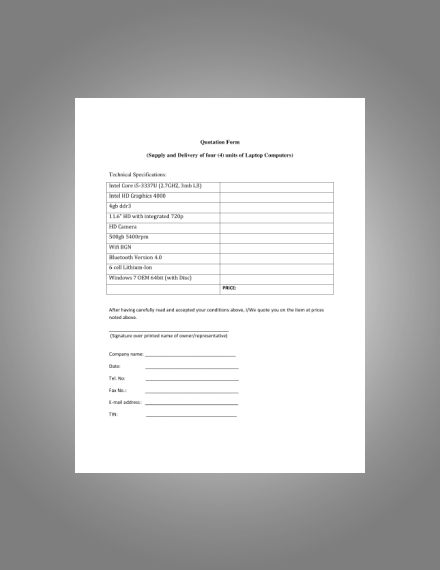 The signature will confirm that the quotation is indeed made by proper authorities and that the person signing the document will be held responsible in dealing with the transaction. 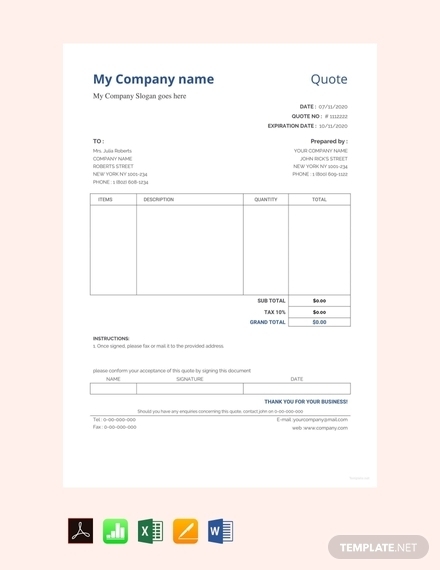 A quotation form is a need for every company in order to answer the request for a quotation or order of a potential client. It does not only feature the price per quantity of the items being requested but also promote the identity and branding of the company. 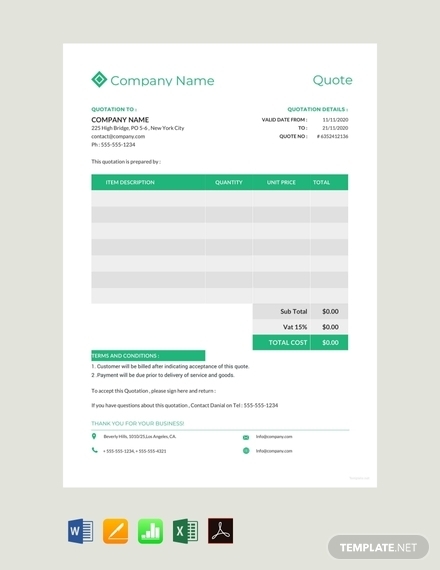 Hence, it is important that even before a customer would ask details about a certain order from a company, the business entity already prepared a quotation form because it really comes in handy as you can immediately edit the content of the quotation according to the specifics needed by the customer. 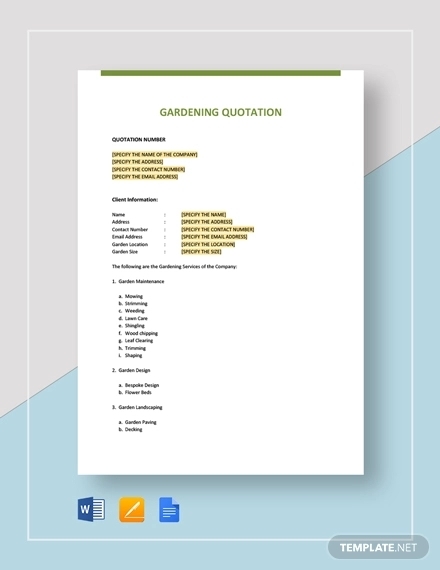 Here is how you can create your own quotation. 1. 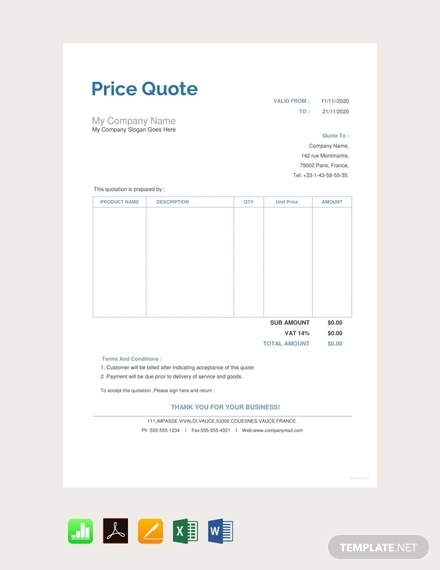 Choose a quotation template: There are a lot of templates of quotation that you can find on the internet that you can as use as your own. All you need is to edit and customize the details and information on the template. You can incorporate your own logo design and business name and all the other key elements of a quotation. 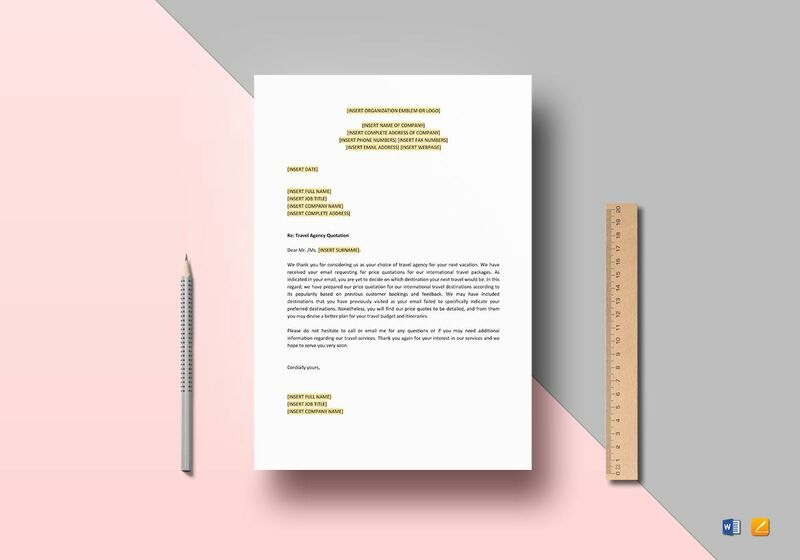 In choosing for the most suitable quotation template, you may consider the personality of your company as well as the industry that you are into. 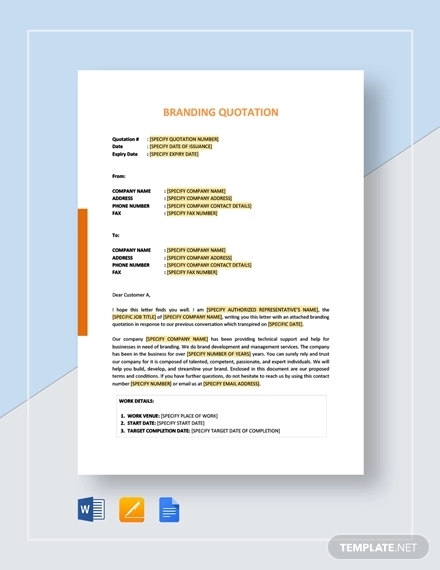 Note that your quotation does not only serve to provide information regarding your products and services but also represent the quality of your service in answering potential customer orders and requests and promote your brand name for the market to know and recognize your company. 2. Evaluate the order or request: You cannot immediately provide the details in respond to the request of a customer when you have not yet evaluated his or her request or order. 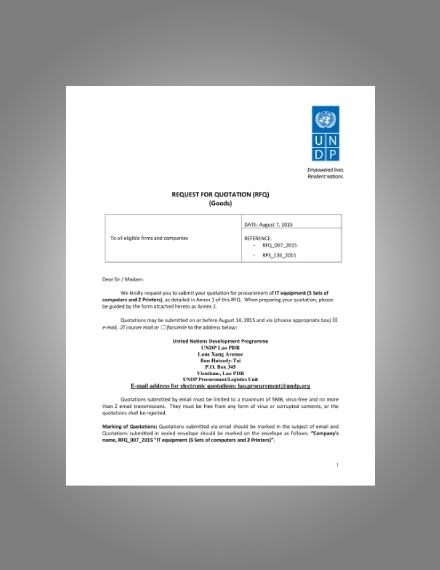 If the request is for a quotation of services, you must evaluate the number of hours needed to complete the project, the price per hour or per project, and other related information. Meanwhile, for the request of a product quotation, you must evaluate what are the specific items that you must provide information. 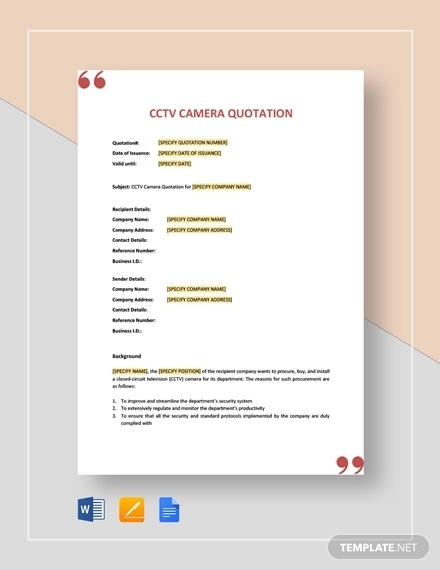 Ensure that you know very well what are the items needed to be included in the list in your quotation so you can deliver a complete and correct information to the potential customer. 3. Input the necessary information: After evaluating the order of a prospective customer, you can now input the necessary information to your quotation. Input the price per quantity of items, the name and contact information of the business and the salesperson in charge of the transaction, the terms and conditions as well as notes related to the quotation, the correct digits of the totals, the validity period of the quotation, the details of the product, warranties, taxes, fees, and other charges, discounts and other deductions, and the signature of the person in charge. 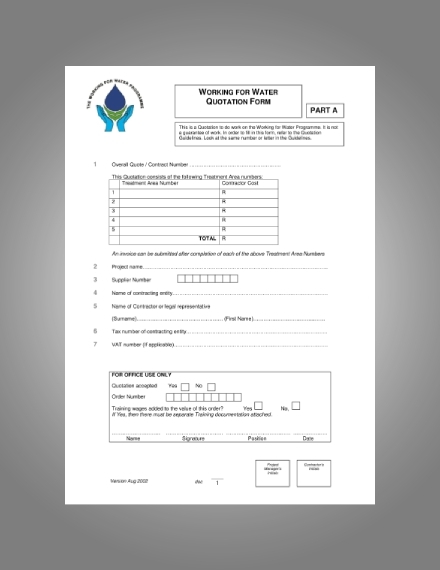 Make sure that the information you include in the quotation is correct and complete. 4. 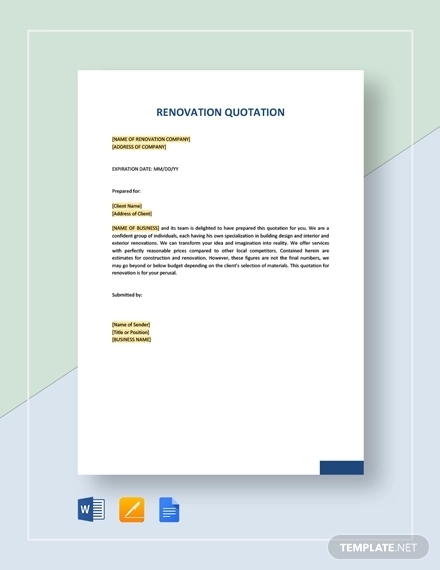 Edit and adjust the layout and style: Now that you have incorporated all the important elements in your quotation, you may try to adjust them to a new position or to your desired style. Experiment with other formats as well until you became satisfied with the outcome. It is important that you leave white spaces in order to avoid clutter. White spaces are the areas in your page that are left blank to give a breathing room for the elements. You may also use boxes, tables, or lines to group related information, making the information in your quotation organized. 5. Check and recheck: After you have incorporated the elements and experiment on different layouts and styles, it is vital that you check, and even double-check, for typos, grammatical, and other errors. These errors may be immaterial, but they can contribute to the credibility of your advertising material. The more errors that your readers spot on your quotation, the more they tend to doubt your document. 6. 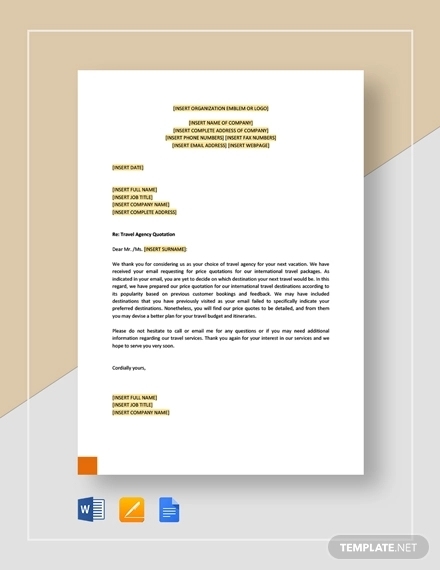 Print and send: Finally, keep a copy of your document and create a printed copy for your customer. An alternative would be to send a soft copy in case they prefer to receive such file. Loco price quotation: This type of quotation means ex-warehouse price where the seller keep the goods in his own and the disposal of such is to shouldered by the buyer. Hence, the buyer has to bear all the expenses related to the carrying the goods from the seller’s warehouse to the buyer’s. This is also known as the spot price. Station price quotation: In this type of quotation, the responsibility of the seller is to shoulder the expenses in sending the goods to the nearest railway station. FOR price quotation: FOR or free on rail price quotation means that the buyer will shoulder the loading expenses, freight, and unloading expenses as well as the expenses in carrying the goods to the nearest railway station. FOB price quotation: FOB or free on board means that the seller’s responsibility is to deliver the goods and to pay all related delivery expenses on board the ship. The buyer will be the one to shoulder the freight insurance and all subsequent expenses. CIF price quotation: CIF or cost insurance and freight signifies that it is the responsibility of the seller to pay for the cost of insurance and freight for the goods delivered. FAS price quotation: FAS or free alongside ship means that it is the seller’s responsibility to pay for the expenses from the seller godown to the ship. The buyer will then pay the expenses from the ship loading to the buyer godown. COD price quotation: COD or cash on delivery means that the goods will be paid in cash by the buyer only after receiving the products. Franco quotation: In this type of quotation, it is the responsibility of the seller to pay all the expenses up to the buyer’s warehouse.